“What’s for lunch today!” the question I (and my cousins) used to ask almost every weekend and we were waiting for the reply that “there’s Mangsho or Aloor Dum”. At times, my mother or Jethima(s) were kind enough to make Ghee Bhat to pair with the Sunday’s Mangsho or Aloor Dum. Aromatic Rice cooked with veggies and nut and most importantly Ghee, Ghee Bhat is so very Bengali. It used to be a treat for us to have the aromatic rice and that was the time we were allowed to go to restaurant hardly once or twice in a year. 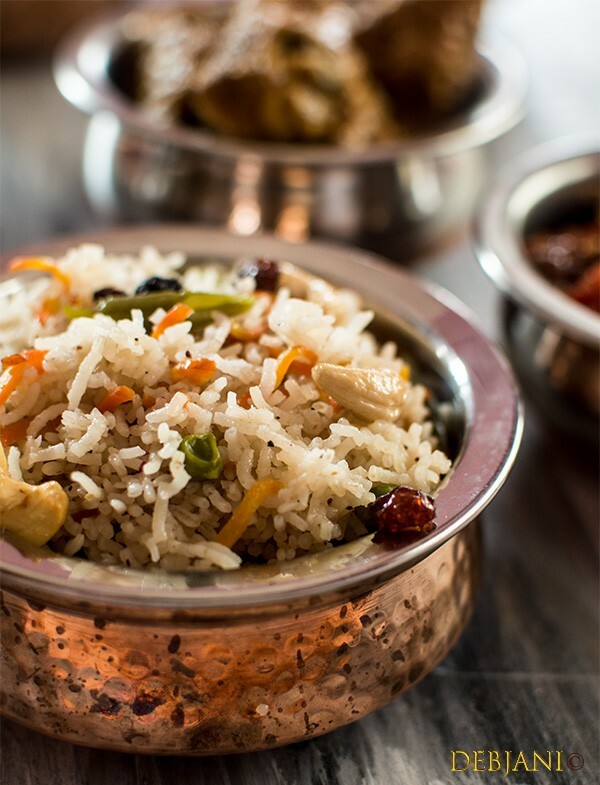 Ghee Bhat is a signature Bengali Pulao prepared with veggies and nuts and it tastes on the sweeter side. Basically, a rice dish which is between Fried rice and Pulav. It’s also known as Misti Pulao in Bengal. You can use either Basmati Rice or with Gobindobhog Rice to make Ghee Bhat. 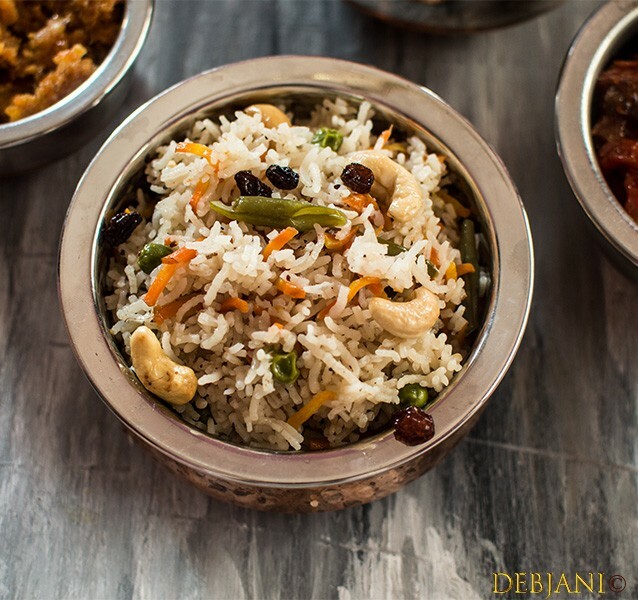 Whenever I serve it with any vegetarian dish I prefer to use Gobindobhog Rice but while serving with Non-veg dishes, I opt for Basmati Rice. I love to add lots of veggies to make it tasty as well as healthy. Our “Nabami” dinner this year was having Ghee Bhat along with Kancha Lanka Murgi! Ghee Bhat is a traditional Bengali sweet Pulao prepared with Rice, Indian spices, and nuts. Bengali Garam Masala Powder: 1 tsp. Wash rice 3-4 times and keep that aside. Take a large vessel / covered pan (preferably non-stick vessel and take the ghee and oil and heat it. Add Cashew nuts and raisins in the hot ghee-oil mixture and fry them and keep them aside after frying. Now temper the Ghee-Oil mixture with Cinnamon, Bay Leave, Clove, Dry Red Chilies, Green Cardamom, Black Cardamom, Sahi Jeera, Jaiphal and Javitri and cook for two minutes. Add chopped French beans and Carrots first and cook for 3-5 minutes in low flame. Then add Green Peas and again cook for some time. Add a little salt for seasoning. Now add washed rice to the mixture and fry for around 5-6 minutes in low flame. It’s very important to fry rice properly to get the typical taste. Add rest of the salt and sugar and Garam Masala Powder and again cook for 2-3 minutes. Now it’s time to add water. You just need to take double water proportionate to the rice. What I do is I use the same bowl where the rice was kept to get the proportion. 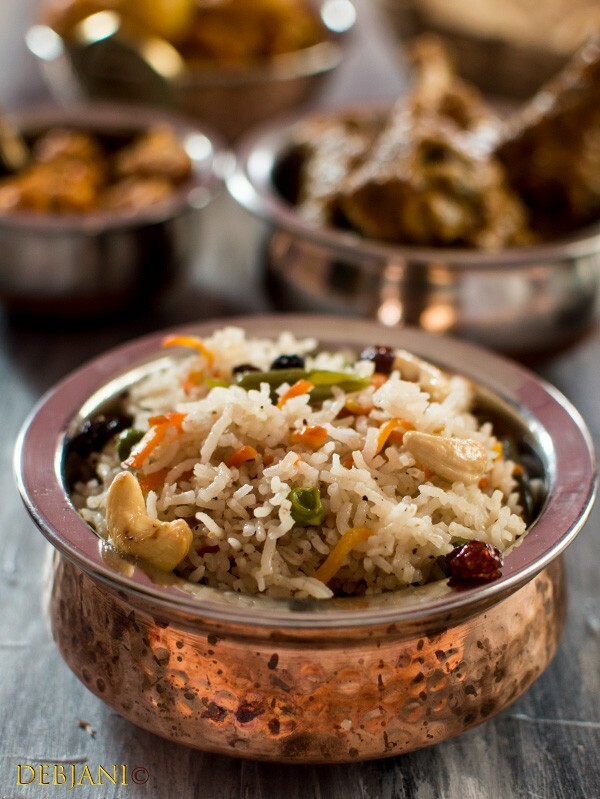 Add right proportion of water and mix the rice loosely with a ladle and add fried cashew nuts and raisins to it. Add slitted Green chilies to the mixture to get a fresh aroma. Bring the water to boil and after 2 minutes take a spoonful of water and taste it to check the salt and sugar and adjust accordingly. Cover the vessel with a lid loosely and cook for 10-15 minutes or till 90% of the water has evaporated in medium or low flame. Water proportion is very important for making Ghee Bhat as if there’s extra water then the end result will be a plate of soggy pulao and vice versa. It goes superbly with typical Bengali veg or non-veg side dishes; however, I love to serve it with Aloor Dum/ Kosha Mangsho / Chicken Kasha/ Kancha Lanka Murgi/ Goalondo Steamer Curry or on special occasions, I serve it with Makhmali Chicken. 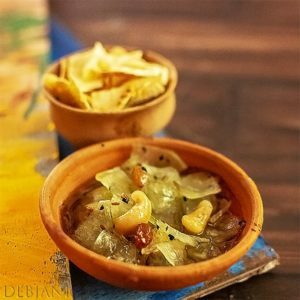 Have you tried the Bengali Ghee Bhat Recipe from Debjanir Rannaghar!